Household lists: Check. Community outreach: Check. Recruitment: Check. TCi Scholar Soumya Gupta, a Ph.D. candidate in applied economics and management at Cornell University, delivers an update on her fieldwork in the Chandrapur district of Maharashtra, India, where she is studying how women’s empowerment and participation in agriculture differs across farming systems and how participation in farm and non-farm employment may affect iron deficiency status. Read her first post here. 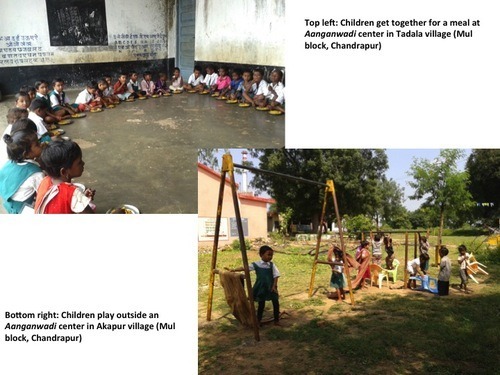 Our formative research took us more than 3,000 kms across 15 blocks of Chandrapur district. Based on that, we selected three blocks for the survey. While paddy is the main crop grown in the Mul block, located 45 kms east of Chandrapur, cotton is the predominant crop grown in the Korpana block, which is 50 km southwest of Chandrapur. 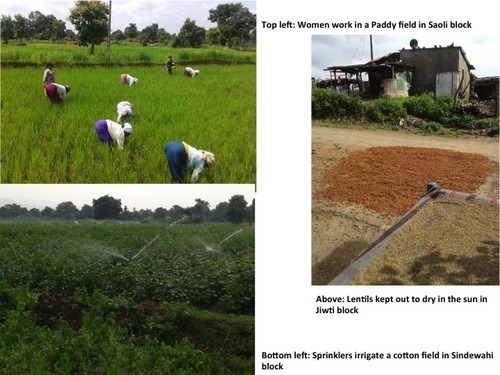 The third survey block is Gondpipri, which is 60 km southeast Chandrapur and features a mix of cash crops like cotton and soybean, and food crops like paddy. Our community outreach activities began once we finalized eight villages for each of the three blocks. As a first step, we visited each village to meet with key village level stakeholders. These included members of the gram panchayat (village level tier of government, the head of which is called the Sarpanch), police patil (police constable) and school principal. We also met with health workers like the Aanganwadi sevika – woman in charge of Aanganwadi centers set up as part of India’s Integrated Child Management Services (ICDS) that provide nutrition education, immunization, supplementation and preschool activities for children six months to six years old – and community health workers known as ASHA (Accredited Social Health Activitist), part of the National Rural Health Mission. We informed them about what we want to do, why we want to do it and how we plan to go about it. Us – Could you tell us where we can find the Sarpanch/Panchayat member of your village? Us – Could you please ask him/her to meet us at the panchayat office? Us – Are you the Sarpanch/panchayat member? Us – So sahib (sir), do you have any questions for us? Do we have your support? Us – So will you discuss it at the next gram sabha (village meeting)? Man – No…. because I am not the sarpanch/panchayat member! Us – Oh, you’re not?! Then who is? We would then request him to let us meet his wife and repeat the conversation with her. In some villages, though, a few/all panchayat members have been dismissed from their posts. The first time we heard this we were hesitant to ask why that was the case. To be honest, the first thought that came to our mind was some form of corruption. But when we heard the same thing in a few more villages we eventually asked other community members about it. We were then told about a rule that requires there to be a toilet in the home of members of the panchayat. Linking a position of responsibility and power to sanitation seems like a novel idea. On the other hand, no member seemed to be in any particular hurry to construct that toilet, even after 6-8 months of being dismissed. However, these dismissed panchayat bodies posed a problem in our second round of community outreach activities, when we had to meet the village communities at large and our selected households in particular. Usually we would email the household list to the computer operator who handed it over to the sarpanch, who in turn handed it over to the sipahi (guard). It is the sipahi who would accompany us from house to house and/or ask people to gather at a common place so we could brief them about what’s going on. When there is no panchayat committee, there is no sipahi who will listen to a disbarred sarpanch and therefore there would be utter chaos when we reached the village! During our first visit we realized just how much household level information is collected at the village level. From records of household property and water tax, to voters’ lists, farmers’ lists, sanitation lists, annual village and school level surveys, and quarterly surveys conducted by the aanganwadi workers, we had access to multiple sources for triangulation of data. That helped to generate a list according to our inclusion/exclusion criteria for the survey. I have to be honest: generating household level lists was not fun. Transcribing the names from pictures in my phone to spreadsheets and then excluding the households that didn’t meet our criteria was the most mind-numbing task ever! Even though the script for Marathi and Hindi is the same (so both Kasim and I would be at it simultaneously), it was often annoying to go through pages and pages of script, some/most of which we couldn’t decipher at one go because they were handwritten in different styles and sizes. What’s astonishing is the IT revolution that seems to be spreading – at an institutional level- in Chandrapur district. Each and every village panchayat office that we have visited had a desktop, a printer-scanner-copy machine, a dongle for accessing the Internet, and a portable webcam (used to click instant photos for things like an election voting card). And with the exception of one village where the computer wasn’t working because there was no electricity – because the panchayat didn’t pay their electricity bill - all of these were in perfect working condition. They each had one computer operator, usually young men and women with diplomas/degrees in computers/information technology. These days, they are in the process of creating soft copies of various village level surveys. For the second round of community outreach activities, we emailed lists of selected households to them a few days in advance. The few times when we had to sit and read out each name one by one to the sipahi over the phone made us realize how much easier things were because of access to email. Us – What do you do? Us – What do you mean? Us – What kind of work do you usually get? Us – Yes, so what usually comes your way? Us – So you do farming….do you own any land? We held our recruitment drive at the Mahatma Gandhi Institute of Medical Science (MGIMS), Wardha. The faculty and staff at the Department of Medicine were with us throughout the day to make sure things went smoothly. Our candidates were assessed on their knowledge of current affairs and computers, as well as their communication skills. I realized how much I take it for granted that one can type or enter basic information in Word/Excel. The interviews went on well into the night, but boy it was such a good feeling when we were done. We finally had our 20 enumerators and two supervisors. Another piece of the jigsaw had fallen into place. By now, we know all the shortcuts to reach the villages, we know all the dhabas (roadside restaurants), and we have our own ranking of their food/dishes so we know where to take our team once the survey starts. I’m keeping my fingers crossed for what lies ahead.